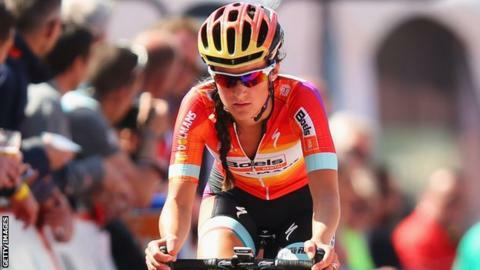 Briton Lizzie Armitstead hopes to recover from last year's disappointment and win the La Course by Le Tour in Paris on Sunday. The 26-year-old Boels-Dolmans rider was barged into the barriers and crashed out of contention in the inaugural event 12 months ago. The race precedes the final stage of the men's Tour de France, which finishes on the Champs-Elysees. "I'm trying not to focus on last year's memories too much," she said. The race covers 89km and ends in a sprint but last year's winner, Olympic champion Marianne Vos, will not be defending her title. However, world champion and home favourite Pauline Ferrand Prevot will be competing. "It's a race where everyone's up for it, everyone's going for the sprint. It's so fast," added Armitstead, who won the British Championship earlier this month. "I'm the fastest of the team at the moment and the team is really focused on delivering me for the sprint. Hopefully I'll be kept out of trouble. "It doesn't make for the kind of racing I like doing - I'll have to play the lazy sprinter role - but sometimes you have to do what the course dictates." Why are Team Sky so good on Tour? Read more on Tour de France 2015: Why are Team Sky so successful?